lubo - distinguished photography: Parson's Lane - A tale inspired by my photograph "Red"
Parson's Lane - A tale inspired by my photograph "Red"
I have long been an admirer of the writing on the Northern Creative blog and our interaction through comments has now resulted in the first of several collaborations, using a selection of my photographs as a source of inspiration for some great writing. 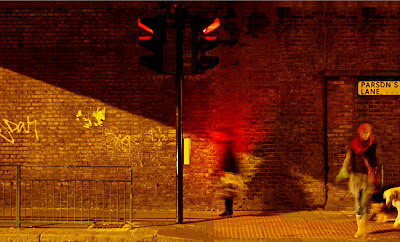 The picture first chosen for this leap into the creative dark is "Red" taken one evening at a pedestrian crossing opposite Parson's Green Tube Station in darkest Fulham.
" Hollow echoes along the lane, a war call. There is no war, but the beer makes it feel that way. Leer at the ladies walking past, skirts short but scowling at this attention........"
ZKbOmR The best blog you have! SHOWstudio review on 11 April 2007 - My movie! Balloons and shadows times deux ! ?